Ethan Miller/Getty ImagesThe GGG-Canelo rematch set for this year may not happen due to Alvarez’s recent doping violations. 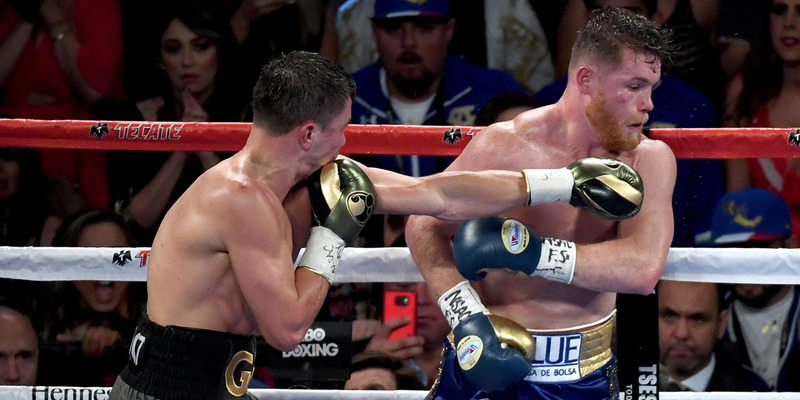 The Gennady Golovkin-Canelo Álvarez rematch set for Cinco de Mayo looks like it will have to be called off after Canelo failed two drug tests. In the wake of Canelo’s violations, the Nevada State Athletic Commission has now formally filed a complaint with the fighter, a step that indicates a suspension could be coming soon. GGG’s camp says he still wants to fight on May 5, but finding an opponent for the middleweight champion on short notice could prove a challenge. The biggest fight in boxing is in jeopardy. Gennady “GGG” Golovkin and Canelo Alvarez were set for a rematch on Cinco de Mayo in Las Vegas, and after their controversial split draw last September, it was due to be the biggest boxing match of the year. But after Alvarez tested positive twice for banned substances during random drug tests administered in February, the status of the fight is now up in the air. ESPN’s Dan Rafael reports that Nevada State Athletic Commission executive director Bob Bennett has filed a formal complaint against Alvarez for his doping violations.With the charge, the NSAC all but confirms that the fight will be canceled, as the commission almost always punishes a fighter once they have filed a formal complaint. Alvarez tested positive for clenbuterol, and stands to be suspended from boxing for a year, but could see a suspension as short as six months if he cooperates with the commission. While it means that the May 5 fight date is likely all but over, there’s still a chance the fight could happen in September, one year after their first match and during the weekend of Mexican Independence Day. Alvarez has claimed that the failed tests were due to contaminated meat, but the Nevada regulations would stand even if that were the case. For his part, GGG still hopes to fight on May 5, but finding an opponent to take on the middleweight champion on such short notice could prove challenging. We’ll know more about the fate of the fight on April 10, when the commission ultimately rules on the case. But with MGM, the venue hosting the bout, already offering full refunds to those who have purchased tickets, all signs seem to indicate that we might need to wait longer than expected to see the biggest fight boxing has to offer.